2 June: Bail has been today denied by a judge despite a report from Medical Justice confirming that Uche was tortured, as he has always said he was, and exactly matching his story. The Home Office said at the hearing that a decision on his case will be given within two weeks. His lawyer is to apply for judicial review of the bail decision. 20 April: An injunction was won tonight on technical grounds stopping the removal. 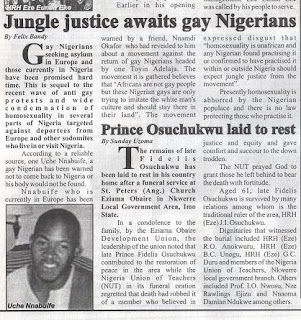 13 April: On Monday a Nigerian newspaper National Times published an article (large JPG) about Uche warning that he would be subjected to "jungle justice" if returned and "his body would not be found." It claimed that a movement existed against the return of gay Nigerians headed by Toyin Adelaja. It said that "homosexuality is abhorred by the Nigerian populace and there is no law protecting those who practice it." Uche Nnabuife is a 33-year old Christian Nigerian national who has been detained at Haslar Immigration and Removal Centre, since November 2009. He has received removal directions for 20 April to Lagos. He is gay and is afraid of being killed if he returns to Nigeria. His fresh claim for asylum has been refused. The judge refuses to accept his sexuality. This is despite the fact that his ex-boyfriend and other close friends are prepared to testify on his behalf that they know him to be gay. He is due to be removed on a chartered flight to Lagos on Wednesday 20 April 2011. Since his lawyer, Hani Zubeidi, managed to get a judicial review in November 2010, Uche has had a difficult few months. He remains in detention, having had a bail application refused by a judge that has found unfavourably in a number of cases of gay defendants. The one thing he needs to prove, it seems that he can’t whilst in detention. Although he has a conviction, he had served his time before being detained and has now been in detention for 18 months. The Guardian has recently reported on the indefinite detention and presumption of deportation of foreign nationals with a criminal conviction. As before, Uche just wants his voice to be heard. He is gay, all of his friends know him to be gay. Yet, he has been forced to live in an environment where he is afraid to admit his homosexuality and has no freedom. 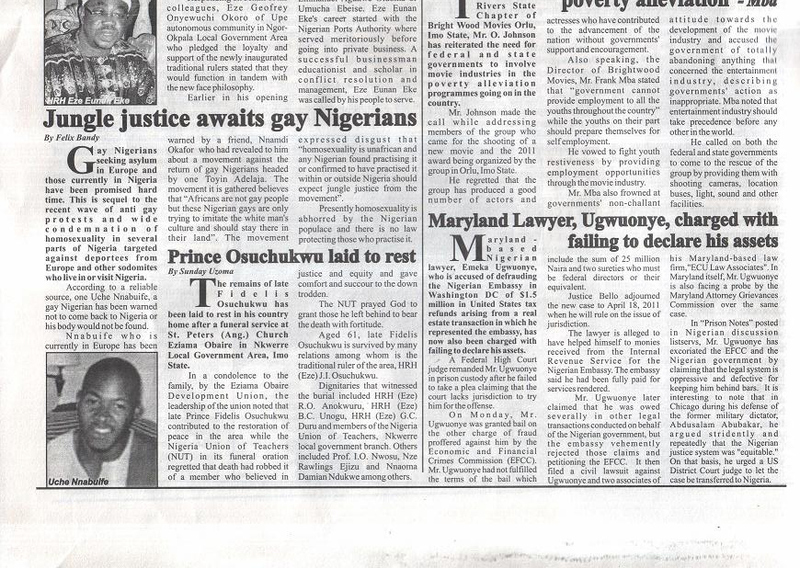 He would like the government to remember that he is a human being and deserves a second chance to live his life in peace, without threat of torture or worse in Nigeria, which is the reality he faces if deported (publicity on the internet following the publication of this appeal demonstrates violent homophobic attitudes in Nigeria).